Presentation from the international conference: "Opium Geopolitics": Afghan Drug Traffic And The Fight Against It After 2014. "Suppose the prisoners were able to talk together, don't you think that when they named the shadows which they saw passing they would believe they were naming things?" The "Hidden" geopolitics: The case of the Afghan heroin production and the aftermath of NATO exit. The issue of the thriving narcotics industry in Afghanistan and more specifically the tremendous opium production in the country that dominates the illicit global trade of heroin, coupled with the likely exit of US and NATO troops over the coming 18-24 months, will have wide range of impacts across the world that affect not only the international political and diplomatic relations of multitude countries, but also they will reflect heavily in the “hidden geopolitical agendas” of nation states and international non-state actors which own a stake in the developments. The expansion of the international heroin trafficking over the past three decades is exceptional in history and is directly related to the modern history of Afghanistan but also to the evolution of para-state mechanisms that operate both in local and in transnational locales and feed themselves through protecting, abetting and assisting heroin contraband. Along those lines, a set of organizations, either terrorist, extremist of sect-like ones are further fuelling drug trade , whilst the nominal and legitimate state apparatuses reluctantly keep a blind eye for reasons extending to geopolitical strategies to simple inner political workings and the need to keep the balance of powers within modern-day “Leviathan type” state organizations. The global heroin trade is difficult to be estimated precisely but it runs to the tube of hundreds of billions of Dollars per annum(1). The role of Afghanistan is crucial since it produces since the early 00’s, from 60% to 95% of global opium output signaling the vital role of this region for the conduct of the illicit trade. The situation over the past few years is actually getting worse with more production flowing from Afghanistan towards the rest of the world (2). The Interpol is quite specific in identifying the real importance of the Balkans in the present day European narcotics market . According to the research of that organization (3), two primary routes are used to smuggle heroin: the Balkan route, which runs through south-eastern Europe, and the silk route, which runs through Central Asia. The anchor point for the Balkan route is Turkey, which remains a major staging area and transportation route for heroin destined for European markets. The Balkan route is divided into three sub-routes: The southern route runs through Turkey, Greece, Albania and Italy; the central route runs through Turkey, Bulgaria, the Former Yugoslav Republic of Macedonia, Serbia, Montenegro, Bosnia and Herzegovina, Croatia, Slovenia, and into either Italy or Austria; and the northern route runs from Turkey, Bulgaria and Romania to Austria, Hungary, the Czech Republic, Poland or Germany. Large quantities of heroin are destined for either the Netherlands or the United Kingdom. At that point the European Strategic Intelligence & Security Center (4) reveals the inability of the authorities to make a difference regardless of their knowledge of the trafficking routes and methods used . “It must lastly be taken into consideration that Kosovo’s porous borders and ramping corruption have offered a new breeding ground for networks of drug dealers in recent years. This has especially been the case of networks run by the Albanian mafia, that prove being particularly hard to infiltrate. The quantities of drugs seized in the region are however worryingly low… Several factors are hindering the efforts of authorities to tackle the drug traffic. The main issues are the lack of regional cooperation, the clan-based and hierarchically well-organized structures of the crime groups, the strategic role of the local Diasporas in the Western countries and the corruption that the Balkan states are dealing with”. Narcotics contraband is also indirectly related to illegal immigration and weapons smuggling, therefore making it a multilevel illegal industry, one that is high in revenue and also linked to corrupted officials in these illicit sectors. It is not an issue that can be singled out by the rest of organized crime activities. 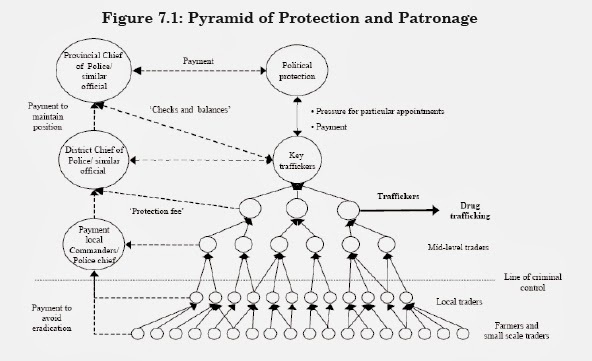 Also it is important to note that illegal organized prostitution rings in the Balkans are directly related to narcotics, since police investigation in several countries have revealed over the years that the drug dealers first raise capital by illegal prostitution & trafficking before venturing into narcotics trade, which is even more profitable . Rarely does a group of people become drug dealers (in a systematic, significant and organized manner) without being involved in either prostitution or goods smuggling previously(5). Further according to empirical research in Greece, mainly conducted through interviews with Coast Guard special force officers between 2004 and 2007 (6), the consensus is that “The same criminal syndicates that ship Afghan heroin to Greece are the same with the ones controlling the flow of illegal immigration from the Af-Pak regions to the EU”. That is also corroborated by numerous court cases whereby international criminal networks operating in Greece where concurrently involved in these two sectors of illegal action. On a wider level, it should be noted that narcotics contraband has extensive international implications. For instance, in December 2009 the U.N. drugs and crime tsar Antonio Maria Costa claimed that illegal drug money saved the banking industry from collapse (7). He claimed he had seen evidence that the proceeds of organized crime were "the only liquid investment capital" available to some banks on the brink of collapse. Thus, the Balkan heroin route for instance, apart from a multi-billion-dollar illicit trade path, is also one generating profits indirectly to corporations thriving in the legal market, such as banks, making the whole issue of combating drug trade an extremely complicated problem that cannot be addressed by conventional measures alone. The aforementioned UN official was replaced soon thereafter in 2010, whilst over the past few years drug related connections have been found in major world financial institutions such as HSBC, Wachovia bank, Citigroup, Standard Chartered, Bank of America, Western Union , JPMorgan Chase & Co. and others (8). The prospects don't look especially optimistic. The current financial crisis and the widespread corruption in the Balkans will ensure that there is going to be plenty of "human capital" readily available to "invest" into narcotics smuggling. Narcotics are a lure for criminals because they are “fast-moving objects” with extremely high yield and return on investment. One gram of Afghan opium provides 10,000% profit to the last chain of heroin retailers which is by far the largest return on investment that any business could ever have. The customs post of Gurbulak in the province of Agri, the first Turkish village after crossing the border with Iran, is the main passage used by traffickers as it lies on the AH1 highway, the huge thoroughfare linking the Far East to Turkey, and then, through the E80 highway, from Turkey to Bulgaria and to Europe. According to the Italian-based security researchers of the FLARE Network against transnational crime, the Gurbulak pass is crossed daily by thousands of vehicles, including about 20 thousand trucks, the vehicles used most in heroin transportation (11). Moreover, the semi-autonomous Kurdish tribes residing in the tri-border region between Turkey-Iran-Iraq, tend to collect dues for all illicit shipments being made there, either narcotics, fuel or people's smuggling, by facilitating such transport. In addition local corrupted public officials are working their way through the system to ensure a steady flow of heroin and collect commissions as an exchange. Once the large shipments enter the Turkish territory coming from Afghanistan, via Iran, they head towards the metropolitan region of Istanbul, an immense urban sprawl of more than 15 million people and the historical junction between Europe and Asia and between the Black Sea and the Mediterranean one. In geo-economic terms Istanbul is the hub of wholesale activities concerning the transfer of opiates and heroin from Afghanistan to Europe. The illegal product is unloaded in secret in warehouses, and then it is routed towards Europe. It is estimated that 37 per cent of all Afghan heroin, or 140 metric tons (mt), departs Afghanistan along the so-called Balkan route, to meet demand of around 85 mt per year. Most of the heroin interdicted in the world is seized along this route: between them, the Islamic Republic of Iran and Turkey were responsible for more than half of all heroin seized globally in 2008 (12). Once the shipments are stored in Istanbul region, they are then re-exported either towards Ukraine and the port of Odessa with the crucial assistance of mostly Ukrainian and Georgian criminal gangs or towards Greece and/or Bulgaria via land routes using as a transport hub the city of Edirne and the help of local criminals. Smaller quantities travel via tourist boats to the Greek Aegean islands and lastly by air, from Atatürk International Airport, connected with the main European airports. The persons responsible for the journey from Iranian borders up to the Balkans, are the Turkish organized kingpins, known locally as "Babas", which means father, similar to "El Padron" figures in Latin America. The Babas, are mostly based in the Anatolian high-plains of Turkey and have access to a vast number of subordinates that work full time with them, either as drivers, logistics suppliers, warehouse owners, money laundering facilitators and other professions. News reports from time to time, estimated that around 25,000 people are full -time occupied in this illicit trade in the country and have a network reaching hundreds of cities and villages along the "heroin route". Iran and Turkey do not have a visa regime between them and border controls are in many cases lax or not strict, thus enabling a rather steady flow of heroin without probabilities of strategic interruptions. Other factors that play a crucial role are the Kurdish populations in the tri-border area between Turkey-Iraq-Iran that facilitate narcotics contraband in order to raise capital, and the widespread public sector corruption in the Balkan countries which permits heroin smugglers to penetrate to an extent local security institutions. Furthermore, the presence of strong and transnationally well-connected criminal networks such as the Italian Ndrangheta, the Montenegro clans, Turkish drug kingpins, Russian, Ukrainian, Caucasian criminal cells and Serbian narcotics groups, should not be overlooked. In essence the Balkan region accommodates strong, socially pervasive and organized criminal groups concentrated and operating in the same region. The continuous flow of opiates and heroin from Afghanistan further fuels these dynamics and their overall economic and political reach. The Central Asian countries are the ones feeling direct effects from the unrestrained increase in Afghan opium production and the ensuing heroin trade that assists greatly into expanding the regional organized crime syndicates. This country faces great challenges by the neighboring Afghanistan and is on the crossroads for the transfer of heroin to Russia from the Eurasian drug route. Tajikistan is the main corridor for the transfer of heroin from Afghanistan towards the North and the West in Central Asia, onwards into Russia. In many instances local drug lords procure heroin through commodity exchange with the Afghans most often with fuel or weapons. This country’s “Afghan heroin issue” is concentrated in the region near the Ashgabat airport where Caucasian crime networks in collaboration with locals conduct wholesale deals of heroin. Similar issues with the rest of the countries, despite continuous efforts by the authorities to upgrade the state apparatus against heroin trafficking. The main concerning Central Asian states vulnerability to the infiltration of the Afghan heroin exports is the sheer geographical landmass to be protected for and the similarities in the ethnic make-up of the nationalities in all countries, together with turbulent recent history, a substantial number of radical and terrorist groups and warlords operating along with international geostrategic interests that prohibit cooperation between all parties. The US Stratfor private intelligence service notes on the geographical and ethnological factor which remains as a constant variable when assessing the situation in a macro-historically fashion. “First and foremost, Central Asia is linked to Afghanistan geographically; Turkmenistan, Uzbekistan and Tajikistan share borders with Afghanistan that collectively span more than 2,000 kilometers (about 1,240 miles). The Afghan border with Tajikistan, along the eastern edge of Afghanistan, makes up more than half of that distance, at 1,344 kilometers. The borders with Turkmenistan (744 kilometers) and Uzbekistan (137 kilometers) run along Afghanistan's western edge. Most of the Tajik-Afghan border is mountainous and therefore poorly demarcated, and the topography of Afghanistan's frontiers with Turkmenistan and Uzbekistan is largely desert” (13) . Moreover there are Tajik, Uzbek and Turkmen populations concentrated primarily in northern Afghanistan and are largely contiguous to their ethnic brethren across the borders in Tajikistan, Uzbekistan and Turkmenistan. The clan-based societies of those nations are able to swiftly conduct drug trade between them based on strong kinships. In Afghanistan eparchies near the borders with Central Asian states there are more than 2,000 laboratories of heroin processing, a staggering number which is combined by ample human resources willing to conduct contraband and a great number of local semi-autonomous warlords that thrive by such trade (14). The reduction of opium production will elevate the wholesale price of heroin and consequently the price in the streets of all international urban centers. That will be a major incentive for the “Mafias” already involved in such trade to consolidate the intermediate chain so as to retain profits and product stocks, in a rapidly decreasing but hotly pursued (by an already extensive addict consumer base) commodity. In simple words, “consolidation” means a series of bloody mafia wars in the chains from Afghanistan to the Balkans and the Eurasian axis from Central Asia all the way to Moscow. Furthermore the increase of heroin price will in the short term lure criminal syndicates to invest more in that sector, aspiring for higher profits and lower their involvement in other illicit trades, such as illegal immigration trafficking which due to the instability in Afghanistan (after NATO’s exit) will increase and will have as a consequence the drop of “profits per unit (humans transferred)”. The disappearance of numerous intermediates due to the aforementioned consolidation will create mega-criminal groups that will monopolize the markets dealing a commodity which will be considered expensive bringing about great amounts of cash capital into fewer hands. The need to establish more effective mechanisms to launder money will become urgency for these networks. In the contemporary European drug market a great number of intermediates can find everyday practical ways to launder amounts not more than a few hundred Euros each daily. In a “merger and acquisition” stage the numbers will increase, so as, the need to create more front companies and find suitable channels to the legal financial system, thus creating emerging sectors of “criminal financing” along the Balkan and Eurasian route. Heroin prices will increase due to limited production and wealth inequality in Afghanistan will rise. Emerging local elites with an abundance of capital would be able to accumulate riches which will lead to political clout, changing the balance of powers in the tribes as it has been formed since 2001. At the same time the heroin addicts in Europe will have difficulty in raising daily the amounts needed to acquire their dose, consequently resulting in more street violence and criminality in European cities. The drug dealers themselves having limited product to distribute but with higher profit margins will tend to provide as little pure “cuts” of heroin as possible to addicts, mixing it with all sorts of chemical products, resulting to much greater health problems and increase in mortality rates. Lastly the recruitment of new addicts will prove to be difficult due to the higher prices involved, thus the crime syndicates in Europe will relay their future drug business growth on acquiring other commodities (Cocaine, methamphetamines, etc.) depending on supply at hand. The exit of NATO from Afghanistan, despite the scenarios described above, provides ample opportunities for the international community to eradicate the heroin problem to a great extent if a set of measures can be implemented and enforced by all parties involved. It should be noted though that organized criminal activities and the narcotics issue will not be combated even if Afghanistan ceases to produce opium , simply because root causes are deeper than any individual country production of drugs and are related with a whole array of crucial aspects of the modern way of life in contemporary societies, along with vested interests of global nature that have to do with geopolitical ambitions, wide spread corruption in the intelligence apparatus of major countries and the heavy involvement of the international financial system. - The international community should make efforts to establish a government structure that includes all ethnic groups, tribes and interest groups. 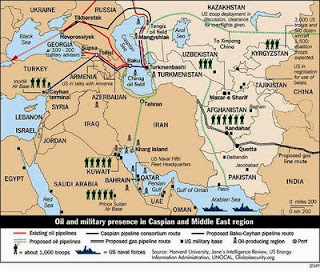 Even before NATO exits the country, the basic infrastructure of Afghanistan (Airports, transportation network, energy sector, education, health system, security bases) should be filled in equal balance by all sides, whilst at the same time monitored so as to prevent its use for heroin export. - An "isolation strip" around Afghanistan’s road axis can also be set up to prevent drugs flowing out of the country. - International bodies such as the UN, NATO, EU, SCO, OSCE, OECD, World Bank, FAO, etc. should agree to assist the Afghan economy and society after the departure of the international forces only should heroin production is severely decreased. Monitoring of the production should be available to the international organizations with penalties of non-financing in cases of non-compliance. - Countries such as the Gulf states and in particular Dubai should be obliged to set up “Afghan reconstructure funds” filled up by the capital that was shipped out of the country illegally by heroin producers and their protectors over the past decade. International bodies should check the outflow of the funds and direct it towards sustainable projects in Afghanistan. - World powers with a stake in the region and more specifically Russia, USA, China, India, as well as notable local powers, such as Pakistan, Iran and Saudi Arabia should agree upon to keep Afghanistan as a neutral zone-buffer state in between their zone of influences, so as to sustain stability and avert civil wars, whilst at the same time find a modus vivendi on how to implement the measures mentioned previously aiming at combating heroin production. - Afghanistan has potentials of becoming an important mineral producer. A guarantee of the international community to invest in mineral production via locally established joint ventures will most certainly boost the potentials of the local economy and shift the focus of capital accumulation of the local population from opium production to mineral one, coupled with a processing and industrial sector. Afghanistan is a county that can be classified as the “Saudi Arabia of opium production”. As the country of the House of Saud is the world largest producer of oil and fully depended on it, so is Afghanistan in poppy cultivation in which it relies the main part of its GDP and a great deal of its social equilibrium between competing tribes that divide their districts of influence based on the control of opium. Nowadays the NATO forces are literally sitting upon a great opium reserve in Afghanistan, which not by coincidence has multiplied its production base since 2001. It is more than certain that strong links that tie up the entire world financial system are relying upon that reserve that keeps afloat a 350 billion Dollars illicit industry, which if leveraged with an average ratio of 10 can pump more than 3.5 trillion nominal Dollars into the international financing system per year. The fact that Afghan producers and most of the heroin chain dealers are exchanging the commodity in US Dollars, further empowers the use of that currency and absorbs to a great extent the inflationary waves been caused by the US Federal bank policy, as it has been shaped since the mid-70’s (15). This phenomenon is not peculiar, nor extraordinary. It is actually as old as the industrial expansion of the West to the rest of the world over the past 200 years. After the British established Hong Kong as a colony in the aftermath of the First Opium War, local merchants felt the need for a bank to finance the growing trade between China and Europe (with traded products including mostly opium).They established the Hong Kong and Shanghai Banking Company (HSBC) Limited in Hong Kong (March 1865) and Shanghai (one month later) (16). The infamous “French Connection” involved Turkey, Sicily, France and USA for a period of more than 40 years, resulting in mass capital accumulation that indirectly paved the way for massive investments in regions such as Nevada, Florida, Caribbean islands by extremely wealthy criminal networks, whilst a great deal of shipping magnates or bankers in the Mediterranean own a part of their wealth in that route. Heroin production should be seen as the other side of the coin, which the global economy. Moreover, every transaction involving heroin anywhere in the planet has an immediate effect in the legal economy through interlinks that are binding both worlds together. 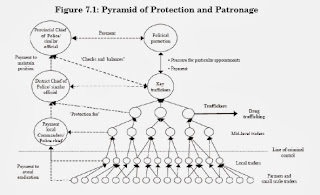 The major issue in all historical periods is who is ultimately controlling the links that funnel illicit funds to the legal economy, through hefty commissions and through the subjective uses of the Law, so as to arrange preferable accumulations of wealth to those who are compliant and to eradicate those who aren’t. Heroin in Afghanistan, as cocaine in Colombia are commodities of illicit nature that can be considered as the “wild cards” of the global political-financial system. Those who are able to control them and manipulate their flow, are the ones who “call the shots” in a wide spectrum of the international economic system, due to the sheer size of the capital involved and the ability to even secure total biological control to the masses of narcotic addicts in almost every human urban settlement in the planet. In that sense the fight against Afghan heroin traffic is a gigantic task that could only be undertaken by the joint forces of the world community and only if the global system as it is in present day is ready to be reformed according to needs of the societies and for the better fate of future generations. (15) The whole issue must be seen in conjunction with cocaine illicit trade and all other drug contraband products which are mainly denominated in Dollars (As are the legal commodities). Thus in a matter of decades a great cycle of absorbing trillions of inflationary Dollars is managed without the financial system collapsing in an instant.